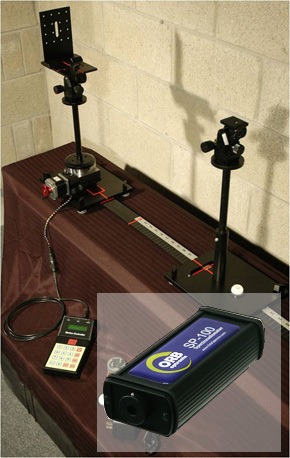 When it came to setting up a lab with a proper precision meter for collecting and evaluating color (CCT) and color quality (CRI), as well as measuring transmission, luminance, radiance, irradiance, and illuminance of light sources and fixtures, I chose the Orb Optronix SP-100. This was done in partnership with a customer, for whom we set up a complete lab with goniometer we built for the customer, for testing their ongoing products as part of a design services agreement. In time as the customer grew in their own capacity, the entire rig, along with the data processing protocol we developed over several years, was transferred to the customers own facility, where staff was trained to complete their own tests in-house, where this is still in use today. This Orb Optronix is an excellent meter on its own. It includes a laser aiming feature that seriously improves setup accuracy and reduces the time it takes to align the test product with the sensor. The SP100 was very easy to learn, and generated usable data from its first day in use. It did take some time to sort out integration times (time the meter is given to process incoming light before recording a value) and to recognize when the dats itself is in error due to a lack of time allowed, or number of samples per reading was inadequate. This is truly a lab grade product, and the price reflect that focus, placing it at the top end of the budget range (>$9,000 to start), which can balloon for those adding more features, adapters, training and other services. I would not consider this a product for a consulting firm looking to evaluate lighting products for specification consideration. While the meter itself is a nice size, and exceptionally accurate, its most at home in a fixed lab, operated by individuals knowledgeable and focused on setting up proper test protocols. There is also one missing bit of data from this meter and its software – that is Illuminance in the form of Lux and/or Foot-candles. Also missing are candella, and lumens. This requires taking the raw data, in other forms, and converting it to these values. In my case, we used spreadsheets to create candella data from illuminance in Lm/M2 then used other programs to convert candella distribution data derived to photometric files, which created the lumen output and other photometric values we needed to relate to architectural use. This is not specifically a fault in this system, it simply reflects the intended purpose of this product to obtain accurate lab level data. 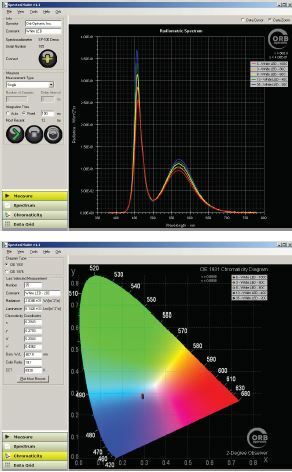 I must qualify that we chose not to purchase the SpectralSuite product offered by Orb Optronix, which produces LM-79 output in proper photometric values, choosing in stead to save the money and do this work ourselves. The basic software package provided with the SP100 is excellent. The software that is included with the SP-100 is excellent in its own right, providing both visual and tabular output for detailed evaluation. The operating process is very simple and intuitive, given a little time to understand the dynamics involved. For setting up a lab in limited space, their were few options within the price range of the SP-100 that would generate the quality of data we collected. However, my first work with this product was over 5 years ago. Since that time, several new products have come on the market that are both better suited to architectural lighting evaluation, and far less costly. Since the SP-100 has been moved to my customer’s site, I’ve moved on to other products to serve the requirement gap the loss of the SP-100 created in my own in-house lab operation. For my own personal business needs, the cost of the software and hardware was a bit more than I was willing to invest, especially when I considered I’d set up my most heavy use customers with their own labs, which significantly reduced demand for testing. As it turns out, advancing technology would not only solve that for me, but deliver new opportunities not possible in 2009. For covering the range of CCT, CRI, spectral power distribution (with very fine fidelity), luminance, radiance, illuminance, irradiance, x,y and u’, v’ chromaticity coordinates, dominant wavelenght and peak wavelength of any light source, I found the SP-100 is a valuable tool.